Reading the note list of Noir, Tom Ford's 2012 masculine from his signature line, can be a bit overwhelming. Have a look (via Sephora): Bergamot Oil, Verbena, Violet Flower, Caraway Oil, Baie Rose, Bulgarian Rose, Geranium Oil, Tuscan Iris Resinoid, Styrax Oil, Black Pepper Oil, Nutmeg, Clary Sage, Patchouli Oil, Vetiver, Leather, Benzoin, Vanilla, Opoponax, Amber Civet. And the kitchen sink. In reality, Noir is an oriental patchouli fest with a healthy side of iris. Patchouli fans, men and women, need to try this Tom Ford fragrance no matter what. Iris connoisseurs might find it a little (or a lot, actually) too rough around the edges. The very first time I smelled Noir on a blotter I thought it was almost crude, but it was my own skin that sold me on this Tom Ford. what can I say? I really like patchouli. And vanilla. And also earthy iris. The interesting thing about Noir is the way it dressed the assertive patchouli in a more exclusive iris suit that might be all that "noir", but still smells mysterious enough and quite velvety. Maybe not black velvet, but how about royal purple? Especially when the violet comes into play. Noir is quite sweet. It has an ambery vanillic dry-down that goes well with the iris-patchouli body. Like everything else, it comes down to taste and skin chemistry; in my case, it really really works, even if the fragrance feels at times like wearing an accessory with a huge logo. One to two small sprays keep Noir on the cozy and less obnoxious side while still providing longevity. I find it as gender-neutral as most Tom Ford perfumes, as long as the wearer is a die-hard patchouli fan. Tom Ford- Noir ($90, 1.7oz EDP) is available from Sephora and most department stores. 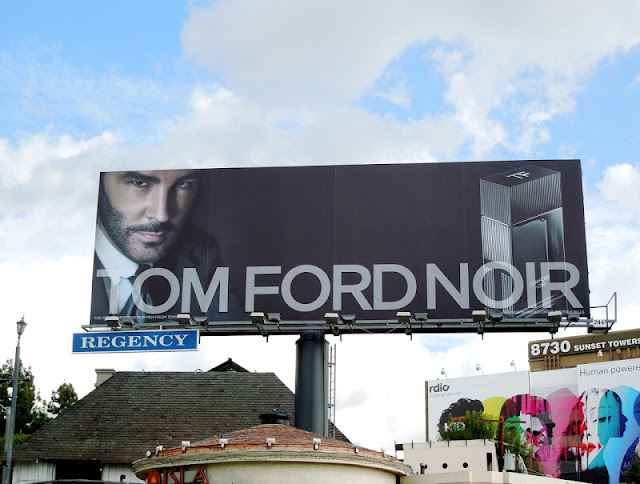 Images: Colin Firth via Stirred, Straight Up With A Twist, Tom Ford Noir billboard ad via Daily Billboard Blog. Thanks for the post - that sounds right up my alley . Can't wait to try it!